The Perfecta Farm B Show hosts special events such as Hunter Derbies and Jumper Stake classes for riders while raising funds for charities in the process. Photo by Andrew Ryback. Streamwood, IL- July 16, 2017 - The tradition continues as Perfecta Farm hosts their 17th annual hunter and jumper “B” show August 4-6, 2017 at Ledges Sporting Horses in Roscoe, IL. 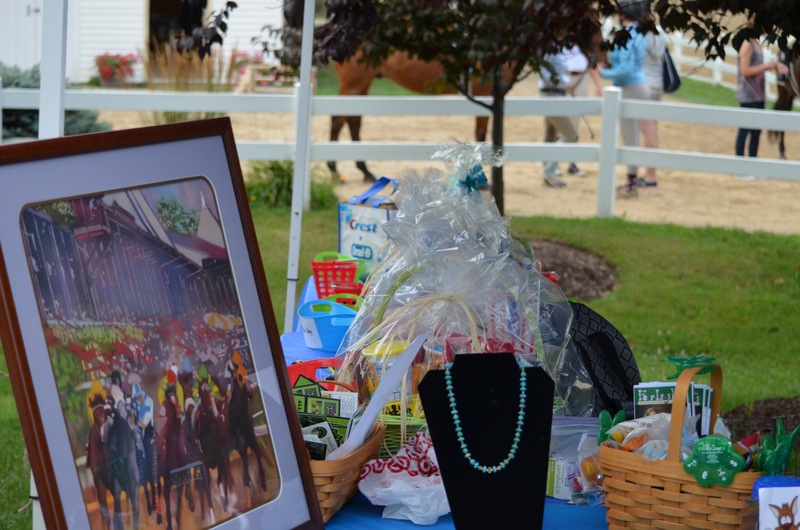 This year, like in years past, the show will be benefiting a local charity and the equestrian community. Perfecta hopes to raise funds for both the Midwest Dachshund Rescue and local riders through their “Sponsor a Rider” program. Perfecta Farm has been offering the “Sponsor a Rider” program for as long as they have been hosting their “B” show. The goal is to give a child or an adult the opportunity to horse show, who might not have had the chance otherwise. The goal is to allow a child or an adult the opportunity to compete along with their teammates when they might not ever get to be in a real horse show for financial reasons. “Sponsor a Rider” covers the cost of the entry fee for one-division, stall, paramedic, and office fees. To reserve you gift certificate contact Mara Kranz by August 1st at 847-774-5011. Some of the raffle items donated last year to raise funds for the Midwest Dachshund Rescue. Perfecta Farm will also be hosting a raffle to help benefit the Midwest Dachshund Rescue. A hospitality tent will be set up at the show where raffle items will be displayed for the charity raffle. You can purchase tickets or make a donation to help the rescue. “It’s a cause very close to my heart, I’ve been involved with Midwest Dachshund Rescue for many years fostering dogs, and helping with the rescue. The money we raise will allow them to rescue more Dachshund’s, help get them more veterinary care, and improve their lives on the whole,” said Gardiner. Perfecta Farm gives numerous awards to exhibitors while donating to charity, thanks to generous sponsors. Photo by Chicago Equestrian. 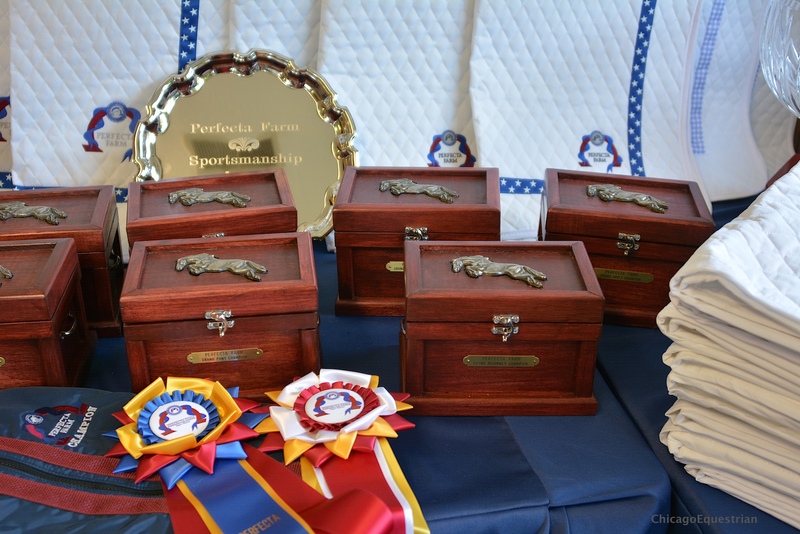 This year’s show will also be offering a $1,000 Children’s/Adult Jumper Classic, a Jumper Sweepstake, the $1,000 Chicago Equestrian Hunter Derby and the $500 Perfecta Farm Hunter Derby, along with many other classes, prizes, and awards. Perfecta Farm is an equestrian facility that caters to not only the serious show competitor but to the rider starting at the entry level. They attend both A and B shows as well as offering schooling shows at their facility. They have a summer camp program with daily riding lesson, crafts, and field trips to exciting horse venues. Perfecta Farm is a friendly, family oriented environment with an emphasis on fun as well as safety. Perfecta Farm is located at 29W211 Bode Rd. Elgin Illinois 60120. Contact them by phone at 630-289-8488 or through their website www.perfectafarm.com or by email at pfarm199@aol.com. Ledges Sporting Horses is located at 1225 Love Road in Roscoe, IL 61073. Photos may only be used in relation to this release.